View from the grounds of Amisfield Winery in the Gibbston Valley. It is a definite must K.
I had the best pie and mash ever in a little pub in Glenorchy. @Annie C I had the best fish, wedges and onion rings! You are rocking NZ @JJ70! Time to go back to NZ!! It's fantastic, close and great for even a short break. Thanks for the beautiful reminders! 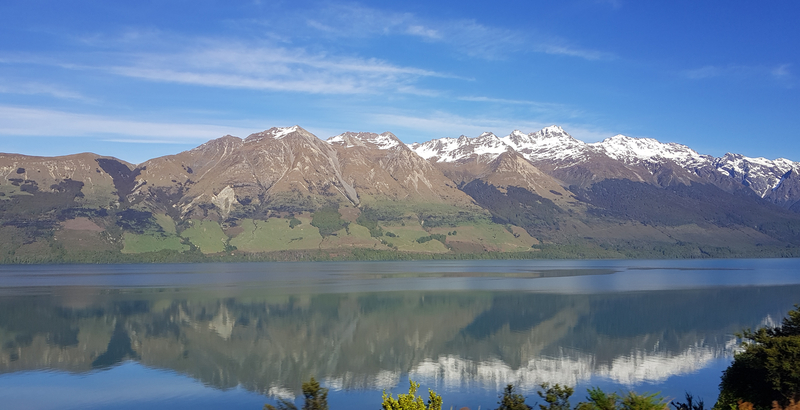 Check out the reflection @Annie C in this photo of the day of the Southern Alps. I would recommend doing The Dart River Jetboat and Funyaks next time in Queenstown. Wow @JJ70! That reflection photo is insane! It is so picturesque and perfect it almost looks computer generated! As stunning as I remember it. @JJ70 - It certainly is a stunning country and their South Island is the best kept secret, I reckon!! I hope to get back again next year - probably the North Island tho - catch up with family & friends ..... and I wanna catch a NZ Snapper & Kingie from kayak!